2013 has officially begun, what are some of your plans? When surgeons have a day off, do they visit other hospitals? Hmmmm. Do lawyers go to the court house to listen in? Maybe. 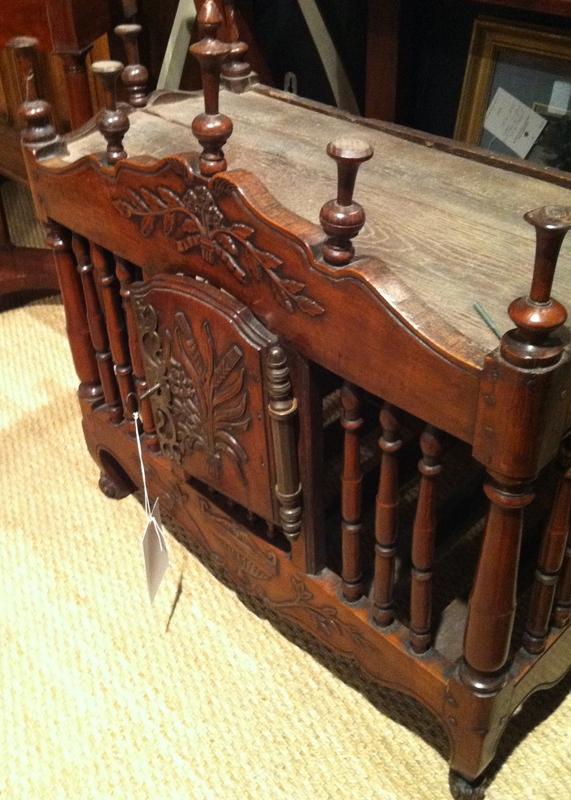 Do antique dealers go antique-ing? YES! I can assure you they do! Funny thing is, I always gravitate to the same OLD things; things I already own one or more of! Would you like to come with me to see what I found on a recent excursion? My living room, a.k.a. the kennel, doesn’t need another dog, but I am drawn to this! I have plenty of Staffordshire dogs, but none like these! We have a family heirloom, a panettiere, the quintessential French cabinet; this one is delightful! 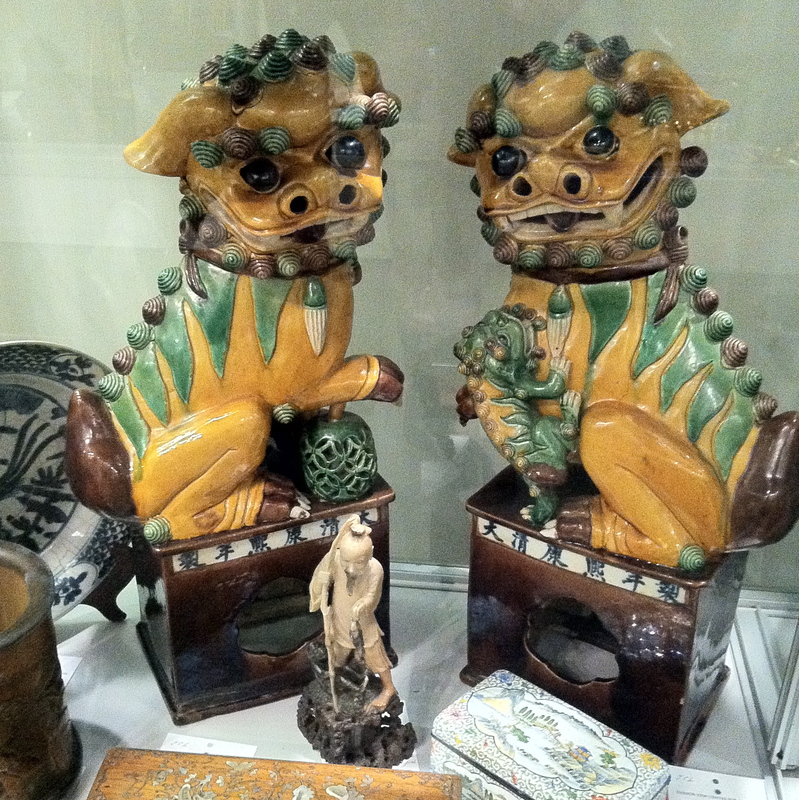 Foo dogs are a favorite, and I don’t have a pair! I haven’t found the perfect ones to live with…yet! I found a case of crystal and opaline boxes. Now I am in trouble. Which one would you choose? Be careful when buying opaline; buy the best and be sure of its quality. 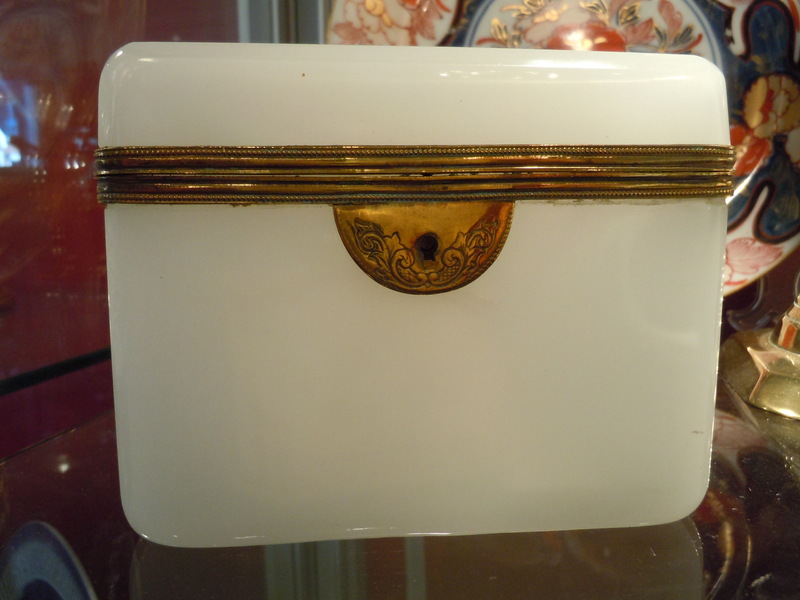 A white opaline box, when held to the light, will shoot flames of color as the light pierces it. The box above is not opaline. 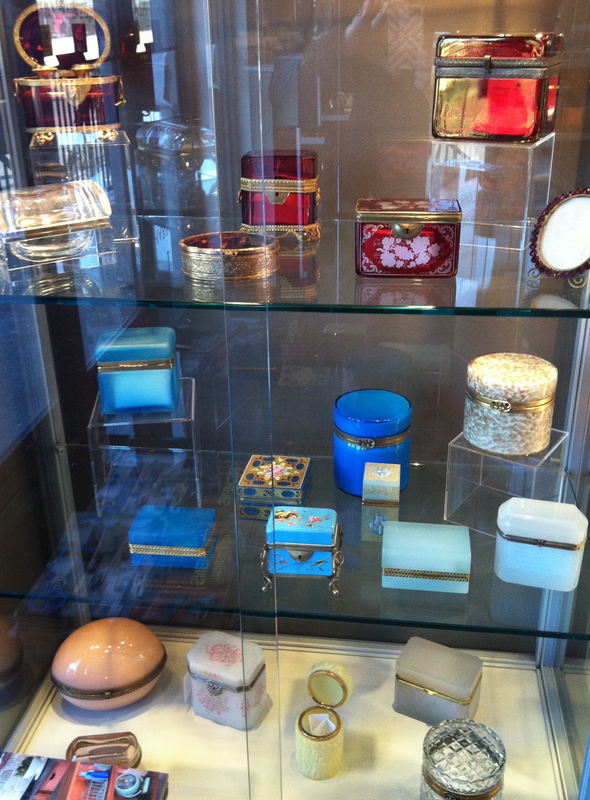 A customer recently asked me if the crystal and opaline boxes could be displayed in a window with strong sun. So many antiques must be guarded from the sun. 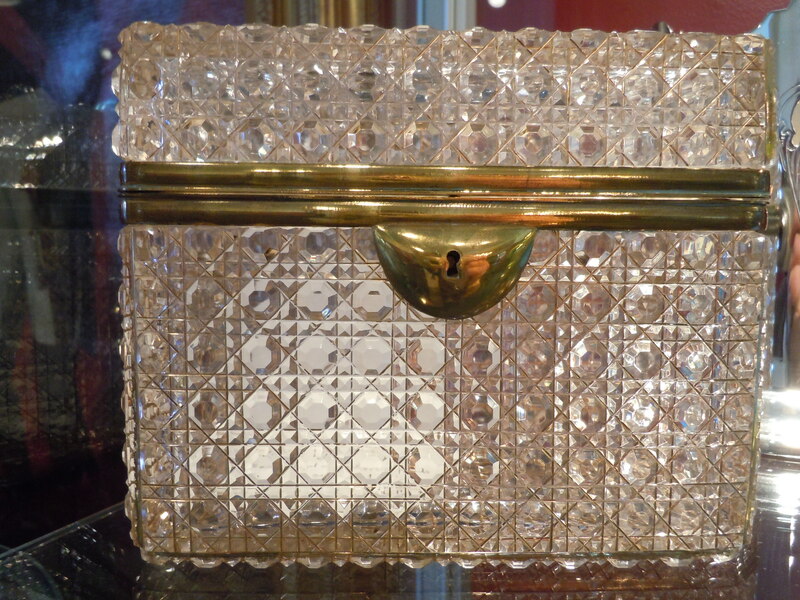 But crystal boxes come to life when light passes through; it is how they are meant to be seen! Just don’t let it get too hot! Didn’t we learn in Girl Scouts we could get a spark of fire with the sun and a magnifying GLASS? I think the shopping expedition is about over. If I leave for home now, I’ll still have time to browse dahlia catalogs. 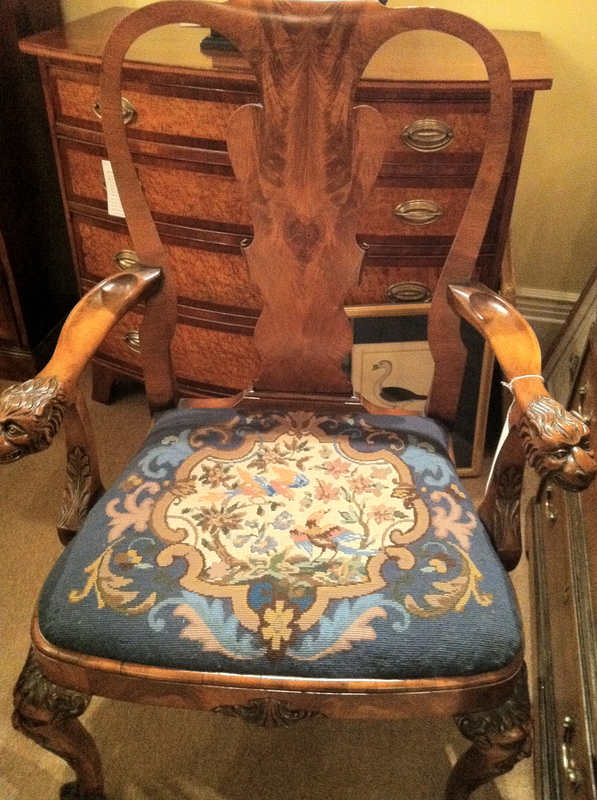 Let me just sit here a moment to collect my thoughts….oh, this is a nice chair! Could I use just one more….maybe? 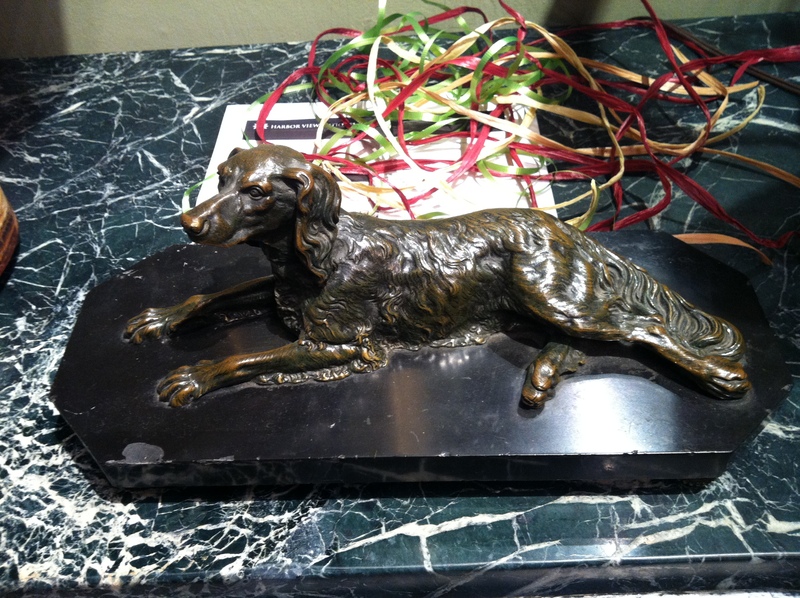 This entry was posted in Uncategorized and tagged antiques, crystal box, foo dogs, opaline box, Staffordshire dogs. Bookmark the permalink. If you aren’t going to buy that chair I think I will! That is the sure way to get someone to make up their mind! You found some beautiful antiques to tempt you I wouldn’t know how to choose between them – maybe I would just buy them all to be on the safe side. I like your attitude! You would be fun to shop with! Thanks for stopping by my blog. So, you are antique dealer? I don’t think I could do that, because I’d want to keep too much. I don’t have good knowledge like you do, though, so wouldn’t know what things are worth. I do collect vintage kitchen towels, mostly from ebay. Here’s a link to a post I did before we got our kitchen remodeled that tells the story of how I got started collecting them, and shows some of them. Oh, and I sometimes grow dahlias, but don’t manage to dig up the tubers to store. Thank you for your perceptive comments on my blog. I came here to learn a little bit about you. OK, I must admit I do not like Dahlias, but, that red one is a beauty. Now antiques. I know nothing about opaline glass. Is there a preferred color? Is one more valuable than the other? They are beautiful. 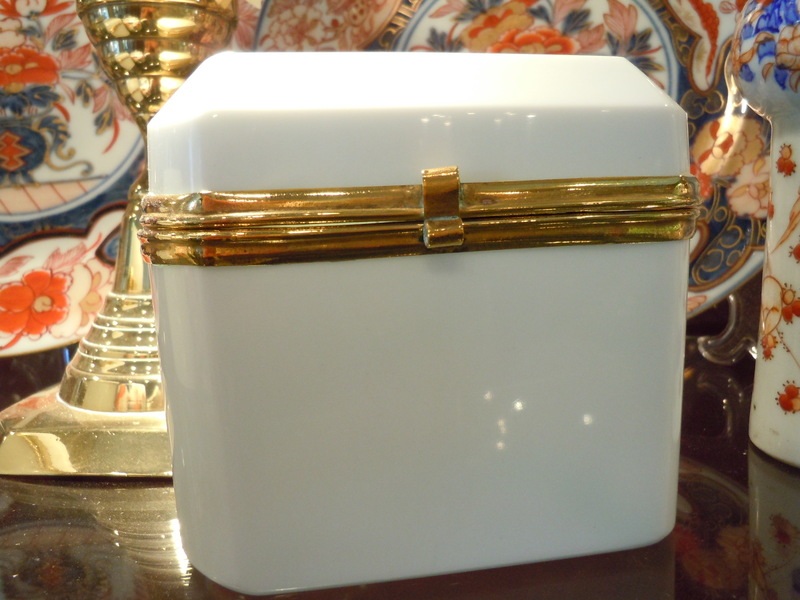 I do adore crystal so I’ll take that beautiful crystal box and one of the blue opaline boxes and…. OK, I’ll take both. 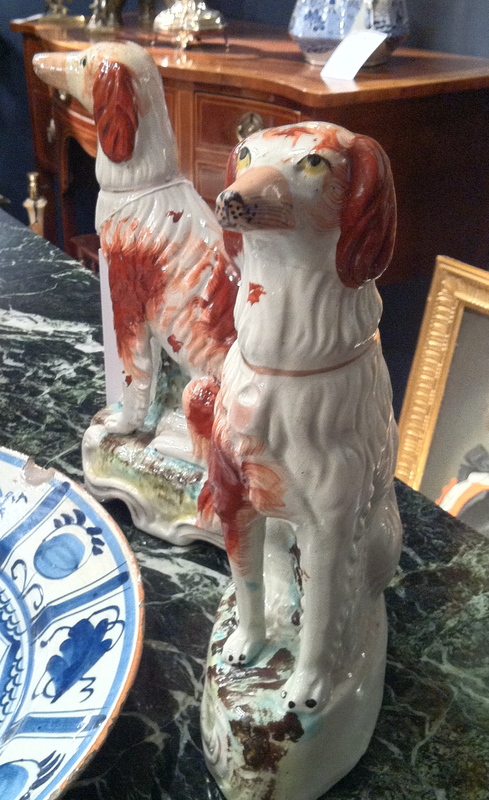 Plus, I love the Staffordshire dogs. There done shopping for the day. Hello, my name is Irina, I have accidentally located your blog thru opaline glass photos. I am a keen collector of opaline glass articles and I love some of the items in the show case you have pictured. I would like to ask you, is it possible to contact the seller? Does he/she sells online? Maybe you would like to re-sell? Thank you for your time, Irina. If there is a particular color you desire, be sure to ask because sometimes they are sold before they even get on the website! Thank you for asking!